I love this time of the year. This bright sunny weather is a perfect time for picnics. This weekend, we are meeting our dear friends in a nearby park for a picnic lunch. I am making a pasta. Pasta makes everyone happy, both kids and adults. While the toddlers run around the grass, we grown ups can chitchat. I am looking forward to this fun day. Now the best part, let me tell you how I made our family favorite Tomato Pasta. 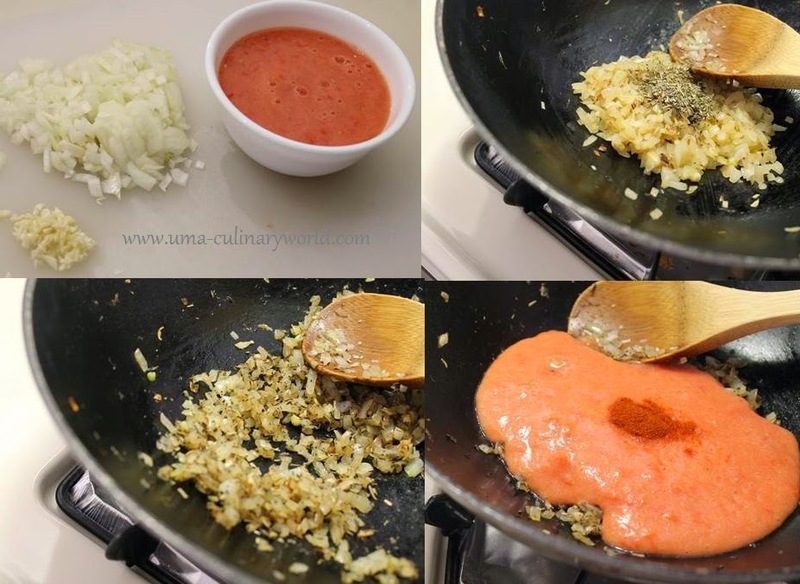 Blend tomatoes in a juicer to a fine puree. Do not add water. Heat oil in a heavy bottom pan. Add onions and garlic. Saute until onions turn slightly brown. Next, add dry Italian seasoning and fresh ground black pepper. Saute for few seconds. Now add the pureed tomatoes and Spanish paprika. Stir well and bring the sauce to a boil. Paprika adds a nice color and slight smokiness to the sauce. Add a little bit more paprika if you like. You can also add 1 - 2 tbsp of canned tomato paste for some color. Lastly, add heavy whipping cream and a pinch of salt. Stir well and lower the heat. Let this whipping cream tomato pasta sauce cook at low heat for about 10 minutes. Keep stirring occasionally. Meanwhile, heat water for cooking the dry rotini pasta. Cook the pasta as per the package instructions. Let me tell you how I cooked my pasta. Add water to a big pot and bring it to a boil. Add lot of salt and stir. Next, add dry pasta and stir well. I cooked the pasta for 10 minutes, stirring occasionally. Save some of the pasta cooking water. Drain the water and add the hot pasta to the creamy tomato pasta sauce. Stir well and cook the pasta for about a minute or two. If the sauce is too thick, add some of the saved pasta water. I didn't need any pasta water. 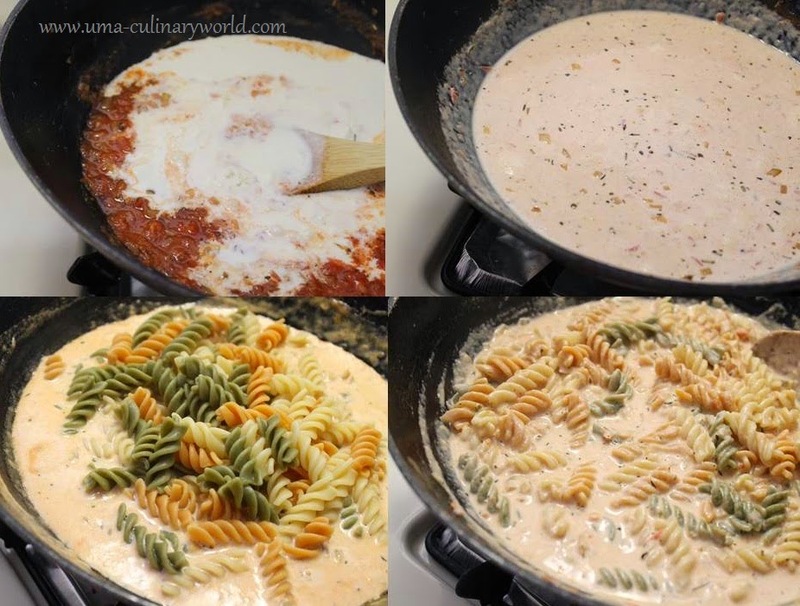 Taste for seasonings and your Creamy Tomato Pasta is ready. Serve Creamy Tomato Alfredo with garlic bread. I am off to pack our picnic lunch. Have a great weekend guys!